Six years ago, RESNET published a major revision of the HERS Standards, officially named the 2006 Mortgage Industry National Home Energy Rating Systems Standards. One important new feature in the standards was the grading of insulation installation quality. Before this change, R-13 insulation installed poorly (as shown in the second photo, below) was equivalent to any other R-13 insulation, including insulation with impeccable installation quality (as shown at the top of this article). If you know any HERS raters, you've probably heard the debates about the various types of insulation and the poor quality of installation they sometimes see. (OK, you're right; it's more than just an occasional sighting.) In fact, the Green Curmudgeon's suggestion that maybe we ought to consider banning batt insulation has generateda discussion that won't die. A home energy rating includes energy modeling to see how energy efficient a home is or will be. Most HERS ratings have been done for new homes that are seeking to qualify for a program's label or certification, such as the ENERGY STAR new homes program. The rater gathers all the information about the building envelope, the heating and cooling systems, ventilation, water heating, lights, and appliances. The data go into the energy rating software, which does the calculations and comes up with estimated annual consumption and costs as well as a number called the HERS Index. The R-value of the insulation in all the insulated building assemblies (walls, ceilings, floors) can have a big effect on the results. Now that raters put a grade on the installation quality, it helps the rater develop a more accurate energy model of the home. When a rater goes in and looks at the insulation, they've got to record each assembly as having a Grade I, Grade II, or Grade III insulation installation quality. Note: This protocol applies to all types of cavity insulation, not just fiberglass batts. Spray foam, cellulose, and mineral wool can all be installed with gaps, compression, and incompletely filled areas, and they can all be installed well. Grade I is the best. This means that the insulation is installed according to the manufacturer's instructions. 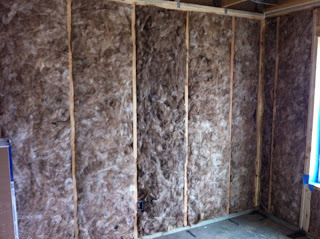 It completely fills the cavity in the case of air-permeable insulation and also is encapsulated on six sides (with an exception for IECC climate zones 1-3). It's cut around electrical junction boxes, split around wires and pipes, and generally not compressed. Grade II is second best. There's some allowance for imperfections in the installation but overall, it's still not too bad. The HERS Standards say a Grade II installation can have "moderate to frequent installation defects: gaps around wiring, electrical outlets, plumbing and other intrusions; rounded edges or “shoulders”; or incomplete fill..."
Grade III is the lowest grade. It has "substantial gaps and voids." Grade I: "Occasional very small gaps are acceptable." In another place, the Standards say, "if the exterior sheathing is visible from the building interior through gaps in the cavity insulation material, it is not considered a 'Grade I' installation." If you're wondering what happens when you do an inspection and find that more than 5% of an assembly is missing insulation, the answer is that you have to break out the uninsulated part and model it separately. If it's new construction, you'll probably be telling the builder to finish insulating, but in existing homes, sometimes you have to model the uninsulated part. The illustration below (image #3), taken from the HERS Standards (Appendix A, pages A-11 to A-16), shows visually what the rater should be looking for. Compression and incomplete fill. Compression is a common problem with fiberglass batt insulation because the batts are often not cut to the proper size for the cavity. Grade I: Up to 2% of the area can have compression or incomplete fill. If a spot is incompletely filled, it must be depleted no more than 30% to attain Grade I. In other words, no more than 20 square feet of each 1000 square feet can have this problem, and even those 20 square feet must be filled to at least 70% of their intended depth. Grade II: Up to 10% of the area can have compression or incomplete fill and again must be filled to at least 70% of their intended insulation depth. Grade III: Unspecified. I take this to mean that any compression or incomplete fill that lies outside the bounds specified for Grade I or Grade II would garner that assembly a Grade III. The illustration below (image #4), again taken from the HERS Standards, shows what these conditions would look like. Most of the time, assigning a grade to an insulation installation isn't really so hard. Sometimes, you look at it and see immediately that it's Grade I. Other times, it's immediatley obvious that it's Grade III. The difficulty comes in when you're on the boundary between I and II or between II and III. That's when you might need to dig a little deeper and get out your measuring tape. If you want to learn more about this, download a copy of the HERS Standards (link below) and read pages A-11 through A-16 in Appendix A. If you're a home builder or insulation contractor working with HERS raters, it's important to know exactly what they're looking for. Putting a grade on the installation of insulation and doing inspections before drywall goes into new homes were two of the biggest changes that RESNET and ENERGY STAR introduced six years ago. New homes that have gone through this process have gotten a lot better as a result.